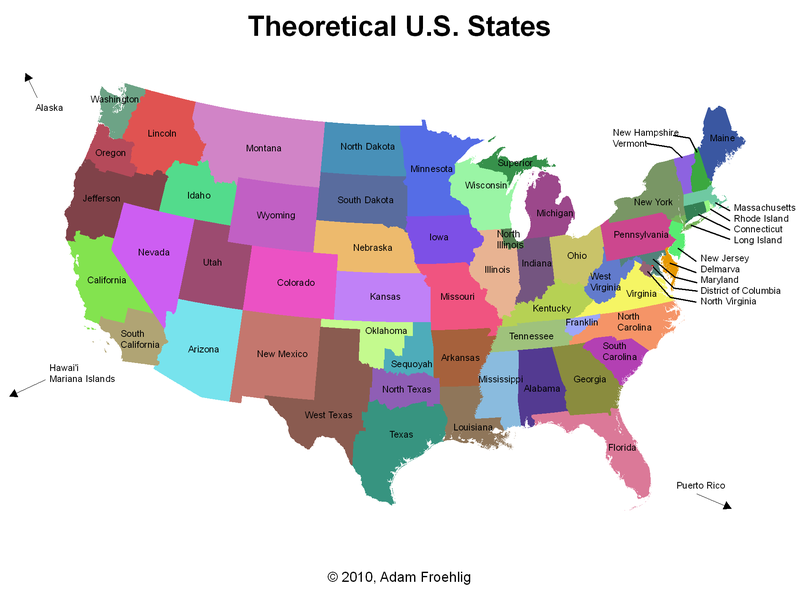 Jump ahead to the hypothetical new states. Jump ahead to the revised state demographic table. A larger version and a PDF version are also available. Delmarva - Capitol: Dover. Largest City: Wilmington. This combination of a new state and existing state is based on a few proposals over the years, mostly by Maryland Eastern Shore legislators, for the Maryland Eastern Shore counties to secede from the rest of Maryland and join with the two Virginia Eastern Shore counties and Delaware into a single state. While such a state could still easily be called Delaware, I've chosen to name it Delmarva (as with some of the legislative proposals) due to the new/revised state covering the entirety of the Delmarva Peninsula. District of Columbia - This one may or may not become a state in the future, but I have included here as the "60th lower state" for completeness..."Lower 59" just didn't sound right. Franklin - Capitol: Greeneville. Largest City: Knoxville. This was one of the "almost happened" states. In the mid-1780s, the northeastern corner of today's Tennessee (which at the time belong to North Carolina) requested statehood from the Continental Congress, but failed in its statehood bid. It managed to survive for about 6 years before being absorbed back into North Carolina, then later becoming part of Tennessee. I have resurrected it here with some changes. The original state, in modern-day county terms, comprised of 11 counties, from Blount to Hawkins and east. I have included Knoxville in this state as well as the counties along and east of I-75 to the north, for a total of 20 counties. I also think the Little Tennessee, Tennessee, Clinch, Emory, and Little Emory Rivers make a more natural southwestern boundary, and so have adjusted county boundaries accordingly, with the small bit of Monroe County north of the Little Tennessee being absorbed by Blount and Loudon Counties. Loudon County north of the Little Tennessee and Tennessee Rivers becomes a new "Lenoir County" in the state of Franklin, with the segment of Roane County between the Tennessee and Clinch Rivers being added to Lenoir County. Roane County to the north of the Clinch and Emory Rivers becomes part of Anderson County, and the state line briefly follows Walden Ridge here. Jefferson - Capitol: Yreka. Largest City: Redding. This state is a "could have been". Due to what regional residents was felt as neglect (real or perceived) from the Oregon and California state governments, a serious proposal for the area to secede and become its own state happened in 1941. The movement got as far as approving a name, a provisional state capitol, a flag, and a provisional governor. What stalled and ultimately killed the idea was the death of the movement's champion plus the attack on Pearl Harbor and the nation's subsequent involvement in World War 2. I have included it here, with the core 7 counties (3 in CA, 4 in OR) plus adjacent counties in both states of similar mindsets, for a total of 21 counties. Lincoln - Capitol: Lewiston. Largest City: Spokane. This is a state that has been proposed off-and-on over the years, most recently in 2005. The core proposal consisted of creating a new state out of the Idaho Panhandle and Eastern Washington (east of the Cascades). As with Jefferson, the new state was proposed due to the perceived disconnect between residents and their respective state capitols, especially in Washington. I expanded upon that to include several northeastern Oregon counties, some of which are part of the "Inland Empire" region that also includes the Idaho Panhandle and Eastern Washington. As with the other regions, northeastern Oregon feels slighted by their state capitol. Long Island - Capitol: Manhattan (New York). Largest City: Brooklyn (New York). One person has suggested that I should call this state "Gotham", and I did consider that as a name briefly. There is a wide and well known disconnect between the New York City metropolitan area and "Upstate New York". In addition, there have been past considerations both for making NYC and Long Island their own states, and at one point for even making NYC its own country. What I've done here is created a new state combining Long Island, NYC, and the downstate counties closest to NYC, mainly those that are bedroom communities for the NYC region, as far north as Orange and Putnam Counties. Mariana Islands - Capitol: Hagatna. Largest City: Saipan. This state, based on a news report out of Australia in 2008, postulates Guam, Saipan, and the other Northern Mariana Islands (all of which have similar culture and indigenous peoples) combining into one and becoming a U.S. state. North Illinois - Capitol: Aurora. Largest City: Chicago. Also could be named "Chicago", and was partially considered for such back in 1925. Similar in concept to "Long Island" above, this state is based on the notable differences between the Chicago metropolitan area and the rest of Illinois. It takes the 8 core Illinois counties of the Chicago area plus Lake (renamed Gary) and Porter Counties in Indiana, and combines them into a single state. North Texas - Capitol: Irving. Largest City: Dallas. According to several websites, the legal basis behind the Texas annexation to the U.S. allows the state to break up into as many as five smaller states. What I have done here is split the state into three while attempting to keep the three regions geographically and socially homogenous. North Texas covers most of the counties north of Waco and east of Abilene, centered on the Dallas-Fort Worth Metroplex. North Virginia - Capitol/Largest City: Alexandria. This state is yet another case of major political/economic/cultural differences between a major urban area within a state and the more rural area of the rest of the state. Also highlighted in the November, 2008 issue of the Washingtonian magazine, this idea postulates Northern Virginia, part of the D.C. metropolitan area, splitting off from the rest of Virginia, using the Rappahannock River and the Blue Ridge as natural boundaries. Puerto Rico - Capitol/Largest City: San Juan. This project assumes that Puerto Rico eventually becomes a U.S. state. Sequoyah - Capitol: Muskogee. Largest City: Tulsa. Another of the "almost happened" states. In 1905, five Indian tribes from what is now eastern Oklahoma banded together to try and incorporate what was then Indian Territory as a separate state from Oklahoma. A Constitutional Convention was formed and the idea went to Washington, where it was ultimately defeated. This "new state" idea resurrects that early proposal, utilizing the modern-day county equivalents. South California - Capitol: San Bernardino. Largest City: Los Angeles. Over the years, there have been numerous proposals to split California into smaller states, including the proposal for the State of Jefferson listed above. This idea for a South California is based on those proposals that suggest a split into 3 states: Northern (covered by Jefferson above), Central, and Southern. This South California includes the area from Ventura, Los Angeles, and San Bernardino Counties south. Superior - Capitol/Largest City: Marquette. The idea of splitting the Upper Peninsula of Michigan from the rest of the state dates back as early as the mid-1800s. It is yet another of the state secession proposals brought about due to real-or-perceived slights against the area's population from the state capitol. In this case, there are also cultural differences between the two parts of Michigan. Some of the proposals have also included the northernmost Wisconsin counties, but I have excluded them here. West Texas - Capitol: Midland. Largest City: El Paso. As with North Texas, this is an attempt to create a geographically homogenous region covering the mostly flat, dry, sparsely populated western half of Texas. The following table was created to show how the new states, the existing-but-revised states, and the rest of the states, compare to each other in some basic demographic categories. In the following table, the new states are highlighted in dark red while those existing states that had borders changed are highlighted in dark orange. Unchanged states have a black background. Data source is the U.S. Census Bureau. (3) - Total area is in square miles, and includes both land and water area. (4) - Density is based on 2008 population estimate and is for land area only. Water area was not calculated. (5) - My estimate of how many U.S. Representatives in Congress each state would have. Assumes the number of House seats increases to 451 (from the existing 435) to accommodate the new states. (6) - For these states, 10% or more of their total area is covered by water.